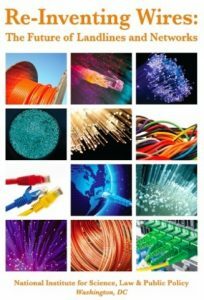 WASHINGTON (BUSINESS WIRE) A public policy report on the Internet and the future of landlines and wireless networks, “Re-Inventing Wires: The Future of Landlines and Networks,” was published online today by the National Institute for Science, Law & Public Policy (NISLAPP) in Washington, D.C.
January 26, 2018: New report evaluates significant risks of planned ‘antenna densification’ in the U.S. and calls for investment in high-speed fiber-based Internet access to every household and workplace. The U.S. Should Instead Invest in Hard-Wired Telecommunications Infrastructure to Support Economic Growth, Bridge the Digital Divide and Diminish Risks to Security, Privacy, Public Health and the Environment. Because broadband networks and the Internet have become vital components of our nation’s physical, cultural and social structure, the future of these networks, the report says, must be steered towards the fastest, most reliable and future-proof, and secure infrastructure available. Such infrastructure would be wired, not wireless. ‘Antenna densification’ plans pose significant risks and do not serve the public’s best interest.